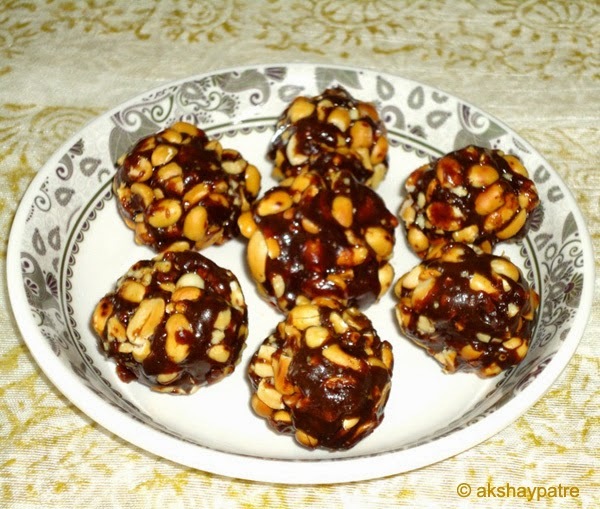 Shengdanyachi ladoo or peanut laddu recipe - Today I have come up with traditional Indian sweet prepared with only three ingredients for you all. That is crunchy and delicious ladoo made with peanuts and jaggery. 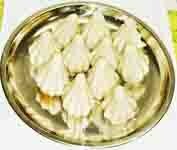 It is going to be one of the best biting sweets for small kids which is healthier than chocolates. We adults whenever feel like having some sweets can have this. 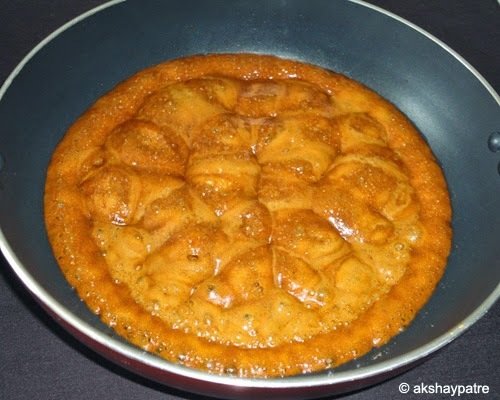 This one is an ideal sweet that can be prepared in a jiffy. Even you can make tilachi ladoo in a similar way. 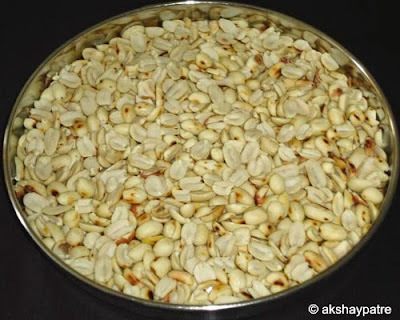 The use of ground nut is versatile in Indian cuisine. You can make shengdanyachi chutney, puran poli, aamti, barfi or simple danyachi koot to mix with the Maharashtrian bhaajis, salads, kanda pohe, sabudana khichdi etc. 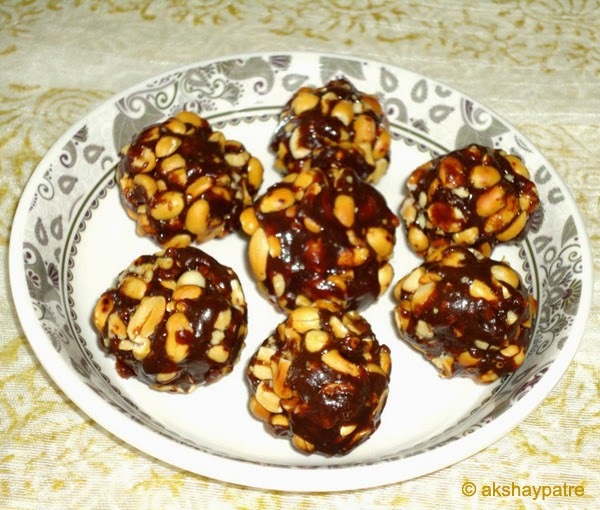 This is an easiest ladoo recipe to try. Roast the peanuts on medium heat till they turn crisp and set aside. Once the roasted peanuts comes to room temperature, remove the husks and set aside. Heat a pan on low heat, add the jaggery and allow it to melt. Stir continuously till the jaggery melts. Once the jaggery melts, bring it to boil. 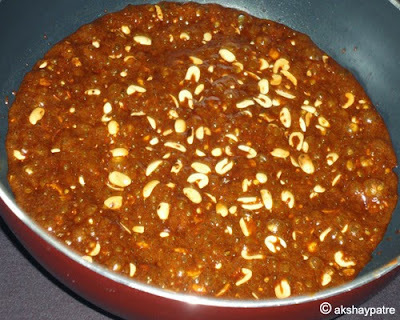 When the jaggery starts boiling, add the roasted and husked peanuts and stir to combine. Further boil the mixture till it become slightly thick. 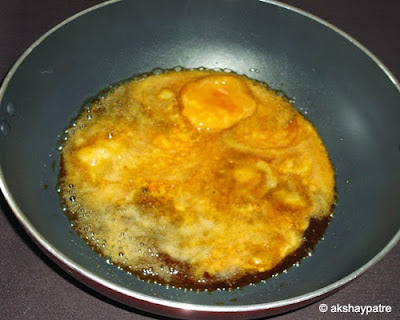 Now grease a plate with ghee and pour the mixture in it. Keep it aside for 5 minutes. Grease your palm with ghee and make ladoo when the mixture is warm. 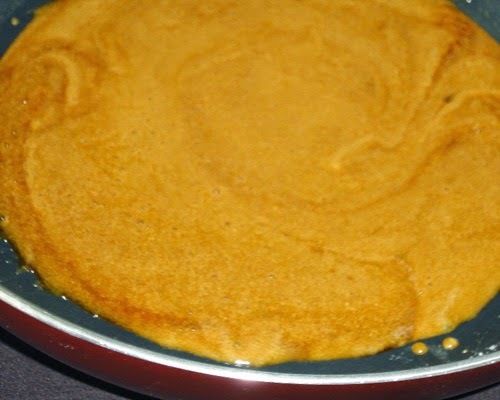 If the mixture becomes cold, warm it on low heat and make ladoo. Store in an airtight container. 1. Roast the peanuts on medium heat till they turn crisp and set aside. 2. Once the roasted peanuts comes to room temperature, remove the husks and set aside. 3. Heat a pan on low heat, add the jaggery and allow it to melt. 4. Stir continuously till the jaggery melts. 5. Once the jaggery melts, bring it to boil. 6. When the jaggery starts boiling, add the roasted and husked peanuts and stir to combine. Further boil the mixture till it become slightly thick. 7. 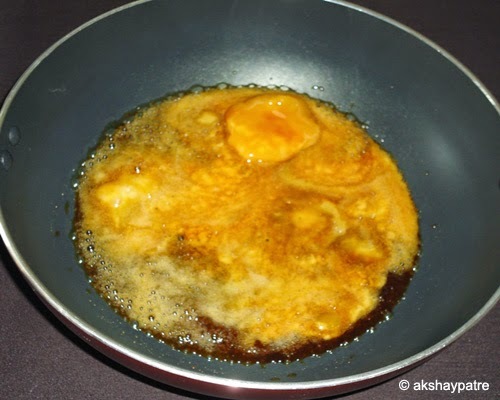 Now grease a plate with ghee and pour the mixture in it. Keep it aside for 5 minutes. 8. Grease your palm with ghee and make ladoo when the mixture is warm. If the mixture becomes cold, warm it on low heat and make ladoo. Store in an airtight container. can u plzz tell me what is jaggery???? Anoshia, jaggery is also called as jaggeree. It is a non-centrifugal cane sugar.